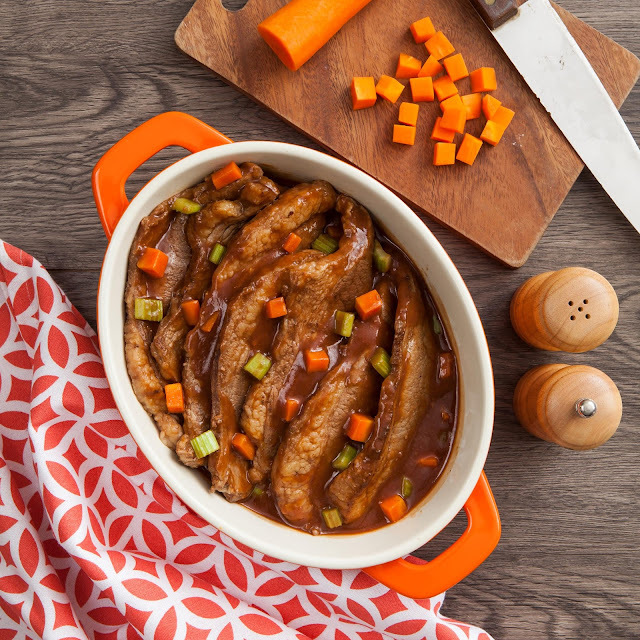 If you’re craving for something saucy and hearty, then you’ll definitely love the 100% Sure-Sarap Beef Belly Pot Roast! Don’t get intimidated, #KitchenQueens. This dish is so quick and easy to prepare. 2. Heat oil in a pot and brown the beef on all sides. 3. When browned, set aside and add the vegetables to the pot to brown. 4. When the vegetables have browned, add the beef and mechado sauce and cook for 3 minutes while stirring continuously. 5. Add 3 cups water and simmer until tender. 6. Remove meat from the pan, then add the the dissolved gravy mix and simmer until thick. 7. Turn off the heat and add the butter. 8. Pour over sliced beef.